The Robert N. Stewart Bridge (foreground), with the Bartholomew County Courthouse and First Christian Church visible in the background. उपनाम: "Athens on the Prairie"
Location of Columbus in Bartholomew County, Indiana. 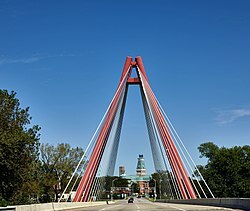 ↑ "City of Columbus Indiana". City of Columbus Indiana. अभिगमन तिथि September 25, 2012.